While it was roughly 2 years from Maxwell 2 to Pascal, the journey to Turing has felt much longer despite a similar 2 year gap. There’s some truth to the feeling: looking at the past couple years, there’s been basically every other possible development in the GPU space except next-generation gaming video cards, like Intel’s planned return to discrete graphics, NVIDIA’s Volta, and cryptomining-specific cards. Finally, at Gamescom 2018, NVIDIA announced the GeForce RTX 20 series, built on TSMC’s 12nm “FFN” process and powered by the Turing GPU architecture. 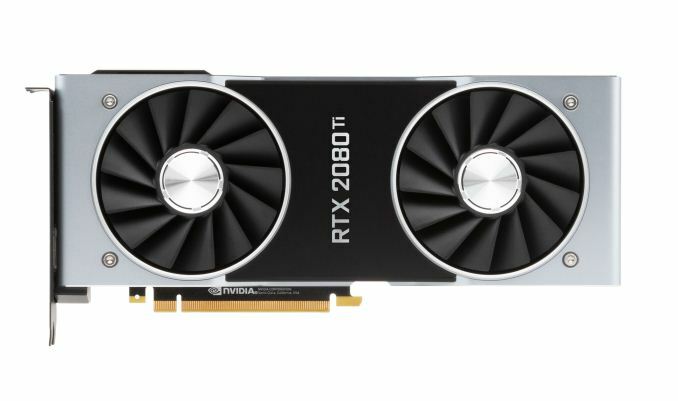 Launching today with full general availability is just the GeForce RTX 2080, as the GeForce RTX 2080 Ti was delayed a week to the 27th, while the GeForce RTX 2070 is due in October. So up for review today is the GeForce RTX 2080 Ti and GeForce RTX 2080. But a standard new generation of gaming GPUs this is not. The “GeForce RTX” brand, ousting the long-lived “GeForce GTX” moniker in favor of their announced “RTX technology” for real time ray tracing, aptly underlines NVIDIA’s new vision for the video card future. Like we saw last Friday, Turing and the GeForce RTX 20 series are designed around a set of specialized low-level hardware features and an intertwined ecosystem of supporting software currently in development. The central goal is a long-held dream of computer graphics researchers and engineers alike – real time ray tracing – and NVIDIA is aiming to bring that to gamers with their new cards, and willing to break some traditions on the way. As we discussed at the announcement, one of the major breaks is that NVIDIA is introducing GeForce RTX as the full upper tier stack with x80 Ti/x80/x70 stack, where it has previously tended towards the x80/x70 products first, and the x80 Ti as a mid-cycle refresh or competitive response. More intriguingly, each GeForce card has their own distinct GPU (TU102, TU104, and TU106), with direct Quadro and now Tesla variants of TU102 and TU104. While we covered the Turing architecture in the preceding article, the takeaway is that each chip is proportionally cut-down, including the specialized RT Cores and Tensor Cores; with clockspeeds roughly the same as Pascal, architectural changes and efficiency enhancements will be largely responsible for performance gains, along with the greater bandwidth of 14Gbps GDDR6. And as far as we know, Turing technically did not trickle down from a bigger compute chip a la GP100, though at the architectural level it is strikingly similar to Volta/GV100. Die size brings more color to the story, because with TU106 at 454mm2, the smallest of the bunch is frankly humungous for a FinFET die nominally dedicated for a x70 GeForce product, and comparable in size to the 471mm2 GP102 inside the GTX 1080 Ti and Pascal Titans. Even excluding the cost and size of enabled RT Cores and Tensor Cores, a slab of FinFET silicon that large is unlikely to be packaged and priced like the popular $330 GTX 970 and still provide the margins NVIDIA is pursuing. These observations are not so much to be pedantic, but more so to sketch out GeForce Turing’s positioning in relation to Pascal. 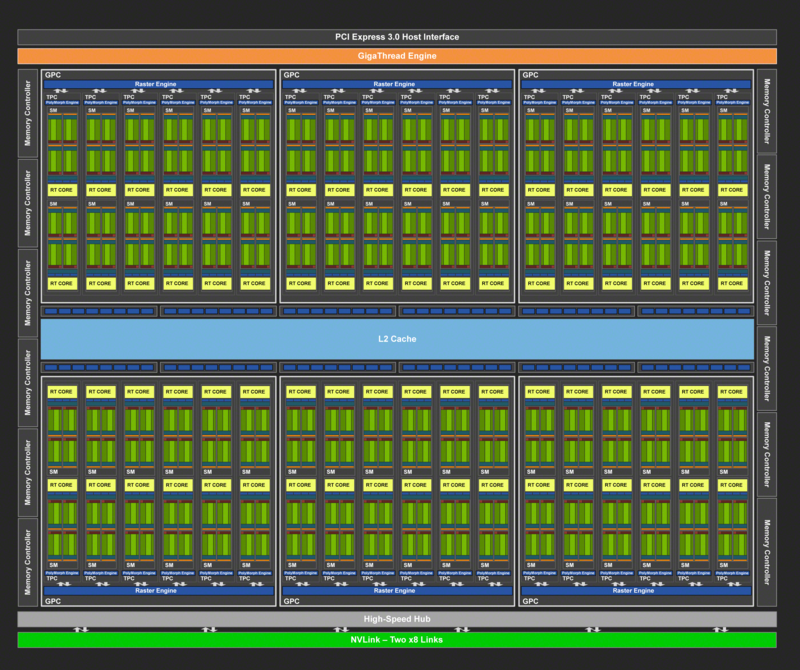 Having separate GPUs for each model is the most expensive approach in terms of research and development, testing, validation, extra needed fab tooling/capacity – the list goes on. And it raises interesting questions on the matter of binning, yields, and salvage parts. Though NVIDIA certainly has the spare funds to go this route, there’s surely a better explanation than Turing being primarily designed for a premium-priced consumer product that cannot command the margins of professional parts. These all point to the known Turing GPUs as oriented for lower-volume, and NVIDIA’s financial quarterly reports indicate that GeForce product volume is a significant factor, not just ASP. And on that note, the ‘reference’ Founders Edition models are no longer reference; the GeForce RTX 2080 Ti, 2080, and 2070 Founders Editions feature 90MHz factory overclocks and 10W higher TDP, and NVIDIA does not plan to productize a reference card themselves. But arguably the biggest change is the move from blower-style coolers with a radial fan to an open air cooler with dual axial fans. The switch in design improves cooling capacity and lowers noise, but with the drawback that the card can no longer guarantee that it can cool itself. Because the open air design re-circulates the hot air back into the chassis, it is ultimately up to the chassis to properly exhaust the heat. In contrast, a blower pushes all the hot air through the back of the card and directly out of the case, regardless of the chassis airflow or case fans. All-in-all, NVIDIA is keeping the Founders Edition premium, which is now $200 over the baseline ‘reference.’ Though AIB partner cards are also launching today, in practice the Founders Edition pricing is effectively the retail price until the launch rush has subsided. In the end, the preceding GeForce GTX 10 series ended up occupying an odd spot in the competitive landscape. After its arrival in mid-2016, only the lower end of the stack had direct competition, due to AMD’s solely mainstream/entry Polaris-based Radeon RX 400 series. AMD’s RX 500 series refresh in April 2017 didn’t fundamentally change that, and it was only until August 2017 that the higher-end Pascal parts had direct competition with their generational equal in RX Vega. But by that time, the GTX 1080 Ti (not to mention the Pascal Titans) was unchallenged. And all the while, an Ethereum-led resurgence of mining cryptocurrency on video cards was wreaking havoc on GPU pricing and inventory, first on Polaris products, then general mainstream parts, and finally affecting any and all GPUs. Not that NVIDIA sat on their laurels with Vega, releasing the GTX 1070 Ti anyhow. But what was constant was how the pricing models evolved with the Founders Editions schema, the $1200 Titan X (Pascal), and then $700 GTX 1080 Ti and $1200 Titan Xp. Even the $3000 Titan V maintained gaming cred despite diverging greatly from previous Titan cards as firmly on the professional side of prosumer, basically allowing the product to capture both prosumers and price-no-object enthusiasts. Ultimately, these instances coincided with the rampant cryptomining price inflation and was mostly subsumed by it. So the higher end of gaming video cards has been Pascal competing with itself and moving up the price brackets. For Turing, the GTX 1080 Ti has become the closest competitor. RX Vega performance hasn’t fundamentally changed, and the fallout appears to have snuffed out any Vega 10 parts, as well as Vega 14nm+ (i.e. 12nm) refreshes. As a competitive response, AMD doesn’t have many cards up their sleeves except the ones already played – game bundles (such as the current “Raise the Game” promotion), FreeSync/FreeSync 2, other hardware (CPU, APU, motherboard) bundles. Other than that, there’s a DXR driver in the works and a machine learning 7nm Vega on the horizon, but not much else is known, such as mobile discrete Vega. For AMD graphics cards on shelves right now, RX Vega is still hampered by high prices and low inventory/selection, remnants of cryptomining. For the GeForce RTX 2080 Ti and 2080, NVIDIA would like to sell you the RTX cards as your next upgrade regardless of what card you may have now, essentially because no other card can do what Turing’s features enable: real time raytracing effects ((and applied deep learning) in games. And because real time ray tracing offers graphical realism beyond what rasterization can muster, it’s not comparable to an older but still performant card. Unfortunately, none of those games have support for Turing’s features today, and may not for some time. Of course, NVIDIA maintains that the cards will provide expected top-tier performance in traditional gaming. Either way, while Founders Editions are fixed at their premium MSRP, custom cards are unsurprisingly listed at those same Founders Edition price points or higher. Yah i agree, especially its only a 20-25fps increase on average. While many might thing thats great, considering the price increase over 1080TI and the fact many 1080TI can overclock to close that gap even more. The features don't justify the cost. However, it could be lots of performance could be unlocked via driver updates..we really don't know how tensor cores could increase performance till the games get updated to use it. Also, while super expensive option...how does the new SLI performance increase performance? Lets see a compare from 1080TI sli to newer sli 2080TI..maybe its easier to put into games? So many what-ifs with this product. There wont be driver&optimization support for 1000 series. They will focus on 2000 series and with that the gap going to increase a lot. Actually I don't and there is also no data to back up what you're saying. The 980ti still competes with the 1070 as it did at Pascal launch. You'll be glad to hear then that we'll be backfilling cards. 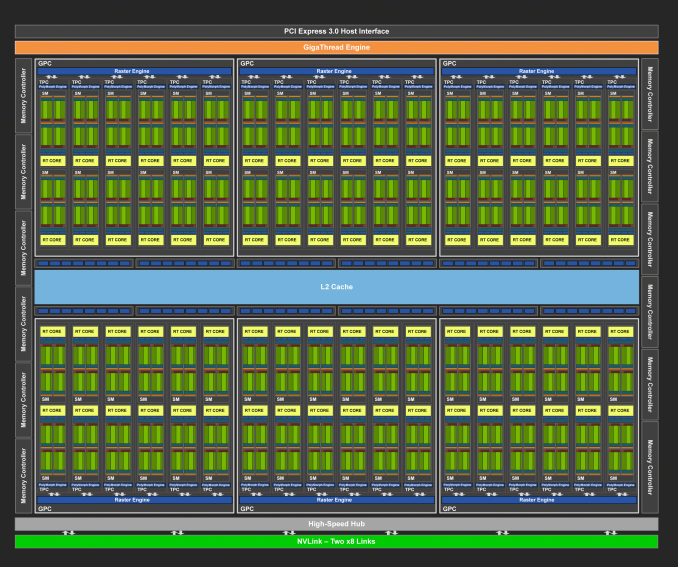 Hopefully you back-fill a substantial amount, the GPU bench this year has been a bit lacking... Especially in regards to mid-range and older parts.